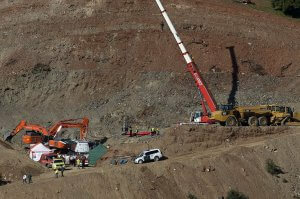 The final autopsy report of Julen Rosello, the toddler who was found dead 13 days after falling into a well in Totalan (Malaga), has indicated that the child died from the fall. Hundreds of engineers, police and miners had been working round-the-clock under the media glare to try to reach two-year-old Julen during a 13-day rescue operation in January. Forensics now indicate that the toddler’s death took place at 13.50h, just a ‘few minutes’ after falling into the well. In addition, forensic experts have ruled out that the death was caused by the use of any pickaxe during the rescue work. Julen fell into the well that was only 25cm in diameter and just over 70m deep on Sunday 13 January. His body was found at 1.25am on Saturday 26 January by the rescue teams – and at 3.29am the body was brought to the surface. According to legal sources revealed to the Europa Press news agency, forensics indicate that the cause of death was cranioencephalic trauma and spinal cord injury. There were two fractures, one in the occipital area and another in the left temporal region. The forensic specialists have also pointed out that it was not a free fall, but ‘slowed down’ by the friction of clothing and sections jutting out within the well. Spain had been riveted by the complex search-and-rescue operation, which was fraught with complications that caused delay upon delay as Julen’s distraught parents and relatives had stood by. Eventually they succeeded and expert miners then began painstakingly digging a four-metre tunnel to join both channels, with the help of small, controlled explosions. Unfortunately when the rescue team finally reached the spot where they were looking for Julen, they discovered the lifeless body of the toddler.